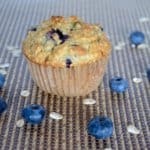 Home » Breakfast and Brunch » Blueberry Oat Muffins -simply THE BEST! 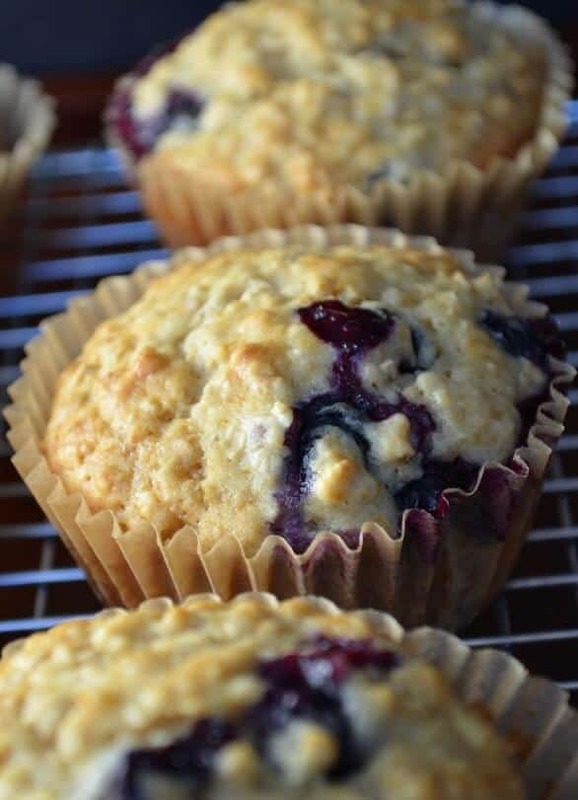 Blueberry Oat Muffins -simply THE BEST! 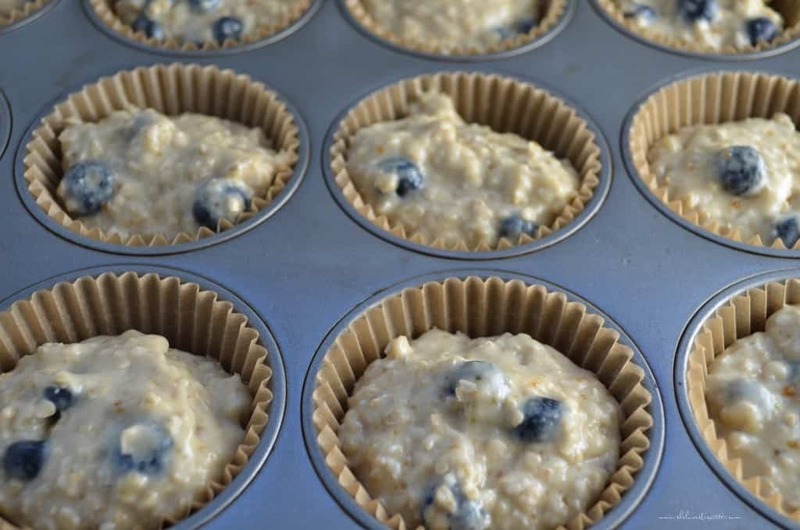 These Healthy Blueberry Oat Muffins will quickly become your favorite recipe when making muffins from scratch. 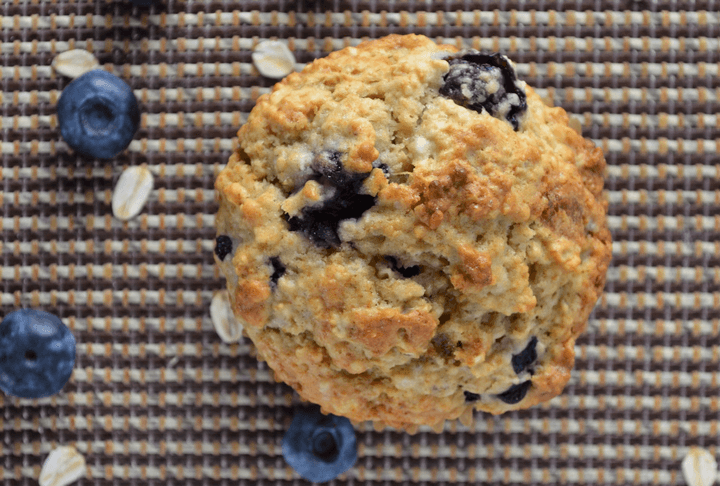 They are simple, wholesome oat muffins, just bursting with juicy blueberries! This post was originally published on Jan 27, 2015 and republished on July 8, 2018 with updated content and more recently with a video (located in the recipe card). 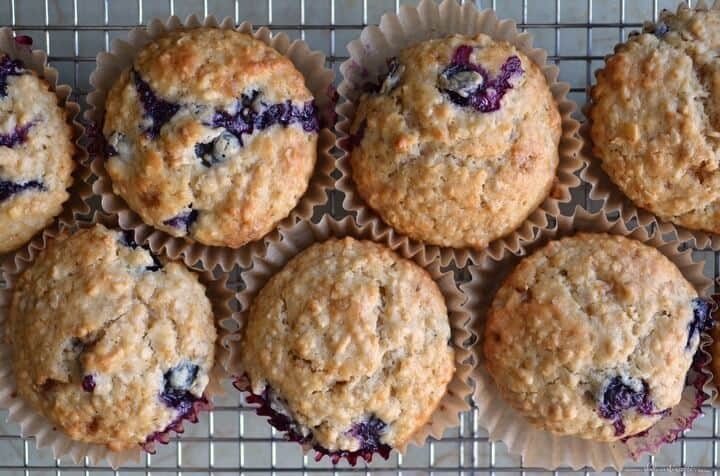 Everyone should have a go-to recipe for Blueberry Oat Muffins. I know a few of you who would tell me that your go-to muffins are at Costco. Well, I would definitely encourage you to go to Costco to purchase their wonderful blueberries so that you can make your own oatmeal blueberry muffins. Once you realize how wonderful these Blueberry Oat Muffins are, I guarantee you are going to be equally impressed with these super moist Banana Muffins and these amazing Date Bran Muffins. Scout’s honor! So, go to Costco, and get your fresh fruits… and then we will combine some plump, juicy blueberries, with oats! You won’t believe how truly amazing these buttermilk blueberry muffins are! As you probably know, muffins are a type of quick bread that usually comes together in no time at all. The only requirements are two bowls and a mixing spoon. Let me show you how in just half an hour, you could be enjoying the best blueberry oatmeal muffins ever! The first thing we are going to do is soak the oatmeal in buttermilk. It is important not to skip this step as this will contribute immensely to the soft, tender crumb of these blueberry muffins. In the meanwhile, measure out the dry ingredients in another bowl and whisk them together. Set it aside. Whisk an egg in the oat mixture along with the oil. Make sure to properly whisk these ingredients together. Add this liquid mixture to the flour mixture and with a wooden spoon, mix only until combined. Then gently add in the blueberries. A few more gentle stirs and that’s it. Portion the batter in a muffin container that has been lined with paper cups and bake in a preheated oven. In about twenty minutes, you will have the best ever blueberry muffins with oatmeal. How to make buttermilk out of regular milk? If you do not have buttermilk, you can still make these wonderful muffins. Here’s how: measure one tablespoon of lemon juice or white vinegar and place in a measurement cup. Pour in enough milk to reach the 1 cup mark. Stir and let stand for at least 5 minutes, so that the acidity can start curdling the milk. I love using buttermilk in pancakes and in biscuits. The end product is always fluffy and I love the “tanginess” of flavor it provides. Recipe update: Over the years, so many of you have tried this easy muffin recipe and have provided some wonderful comments. 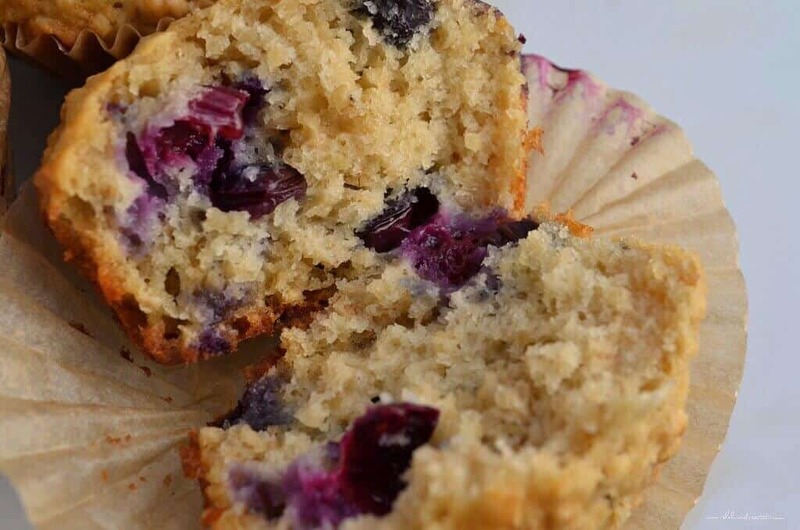 Thanks to all of you for trying and sharing this blueberry muffin recipe (24K shares and counting!!!). Rebecca used whole wheat pastry flour and commented “This is a great recipe”. Sandra used 1/2 whole wheat and 1/2 white flour and she “loves muffins that taste like muffins and not cake”. Bill used “whole oats and whole oat flour” and his granddaughter “wouldn’t let go of them”. Lisa used coconut oil and stated “keeper recipe”. Leah added cinnamon and stated “delicious muffins”. Morag replaced the plain flour with a 60/40 rye/rice flour combination which resulted in a “soft and light” texture. Needless to say, this obsession with recipes has resulted in quite an assortment of cookbooks over the years. 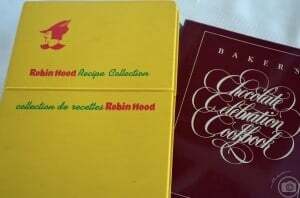 This library of mine also includes collections of recipes that I obtained by mailing in the UPC code and/or a money order in exchange for the booklets. I’ve adapted this recipe for buttermilk muffins from the “Robin Hood Recipe Collection”. I’ve been making them for decades and it has always been appreciated by family and friends. From one muffin lover to another, I hope these muffins will become a tradition in your home, too! 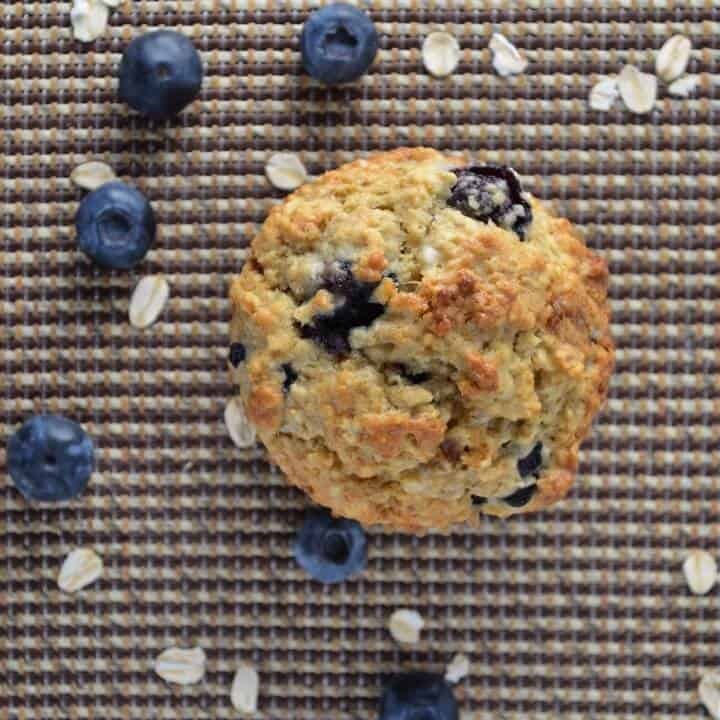 ★★★★★ If you have made this Blueberry Oat Muffins recipe, I would love to hear about it in the comments below and be sure to rate the recipe! 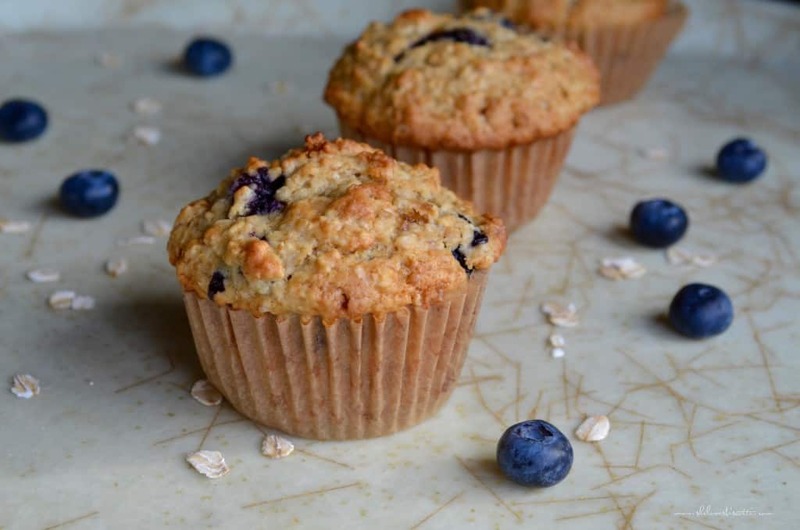 Simple, wholesome oat muffins...bursting with blueberries. Paper line 12 muffin cups. Combine oats and buttermilk in small bowl. Let stand while preparing other ingredients. In a large mixing bowl, combine flour, baking powder, baking soda,salt and brown sugar. Whisk together. Set aside. Add beaten egg, oil and lemon zest to oat mixture. Mix well. Add oat mixture all at once to the dry ingredients. Stir just until moistened. Fill muffin liners 3/4 full. Bake for 15-22 minutes or until top bounces back when lightly touched. These can keep for a couple of days in airtight container at room temperature. They can also be frozen in airtight container for up to a month. The original recipe calls for melted butter, but as you can see, I substituted with vegetable oil. The 1/4 cup of vegetable oil can be replaced with applesauce. The all purpose flour can be replaced with whole wheat flour. Wow these were amazing. So soft and fluffy. They did end up a little salty, I’d halve or quarter the amount of salt next time. Thanks so much for taking the time to comment, appreciate it Christine. Great! Thanks so much for taking the time to comment. Appreciate it. I made both the banana muffins with the chocolate chips and walnuts and the blueberry lemon muffins. They were both moist and delicious and my family loved them. Thanks so much for 2 great recipes. I can’t wait to try other ones you have. Thanks Carol. There is nothing like a warm homemade muffin! Thanks so much for taking the time to comment, appreciate it! These came out amazing! Just had two of them right out of the oven! The recipe was on the spot, and unlike another commenter, I found sweetness to be just perfect, and I don’t even like things very sweet. Maybe they used compact brown sugar rather than the recommended light pack? Oh, it’s also worth mentioning that I used melted coconut oil, added a few drops of vanilla extract while beating the egg, and rubbed brown sugar with lemon zest before mixing, to get the natural oils out and enhance the lemon flavor–best homemade blueberry muffins you can get your hands on! Thanks so much Maria for sharing!!! This is a keeper and I’m sure I’ll be making these bad boys over and over again! I literally make these every weekend and pack 2 in my husband’s lunch each day during the week! They are fool-proof and absolutely delicious! Thanks! Hi! I have made these several times and LOVE them. I would like to try them again today and substitute unsweetened applesauce for the butter/oil. Have you tried that? I know it will change the texture, but am wondering if they will bake up okay…. Just made these today and topped with some nuts. ( I also added bran in the oatmeal soak step ) Loved them! not too sweet . This is muffins muffin! Hello – I’m anxious to make these and hate going to the grocery store, lol – can I use my frozen blueberries? Thanks! Yes, no need to go to the grocery store. No need to thaw. Be sure to roll the frozen blueberries in a little bit of flour to prevent the whole muffin batter from turning blue. Great comment Cindy! Thanks for stopping by. I made them this evening. I doubled the recipe and added 1 tablespoon of flaxseed and a teaspoon of nutmeg. I had frozen mixed fruits (blueberry, raspberry and blackberry) so used them. I also didn’t have lemon so used orange zest. For the buttermilk I used 1% milk and apple cider vinegar. I had quick oats so used it too. Thanks for this recipe! It’s definitely for keeps!